The fourth on-property hotel at Universal Orlando, the Cabana Bay Beach Resort is the theme park property's first in the value category. Except somebody seems to have forgotten to tell the hotel's designers that it was supposed to be value-caliber. Sure, the prices are reasonable—less than Universal's other three (wonderful) hotels and about the same as three-star accommodations along International Drive or elsewhere outside of the campus—but the rooms are relatively spacious and quite comfortable, the amenities are plentiful, and the sense of playfulness and whimsy is everywhere. 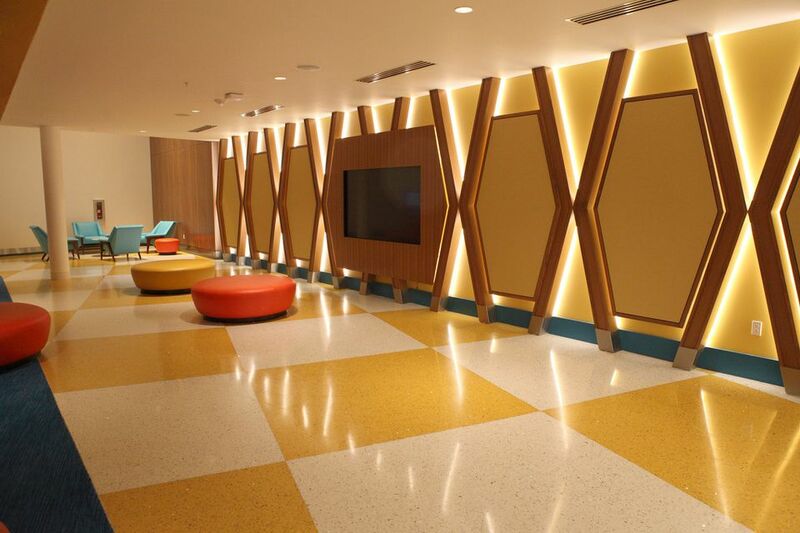 We'll explore many of the great features and benefits of staying at Cabana Bay. In general, we highly recommend that you consider booking a room at the hotel. But there are a couple of things you should know up front. One of the most appealing features of Universal's other three hotels (like Cabana Bay, they are also operated by Loew's Hotels) is that all guests get to skip nearly all of the standby lines at both Islands of Adventure and Universal Studios Florida. As a value resort, Cabana Bay does not offer that benefit. During busy times, visitors could purchase Universal Express skip-the-line passes, but with the extra cost, it may make more sense to upgrade to one of the resort's pricier hotels. Note that Cabana Bay guests DO get to sneak into the Wizarding World of Harry Potter - Diagon Alley and the Wizarding World of Harry Potter - Hogsmeade one hour before offsite visitors, which is a great benefit. Unlike Disney World's sprawling resort, Universal Orlando is relatively compact. However, Cabana Bay is on the outskirts of the property. It is a pleasant, but somewhat long walk of about 20 minutes to the two theme parks. There are complimentary shuttle buses that operate frequently, but the water taxis that serve Universal's other three hotels do not make it over to Cabana Bay. OK, now that we've addressed those issues, let's move on to the cool things that make Cabana Bay so wonderful, starting with its retro mid-century look and feel. 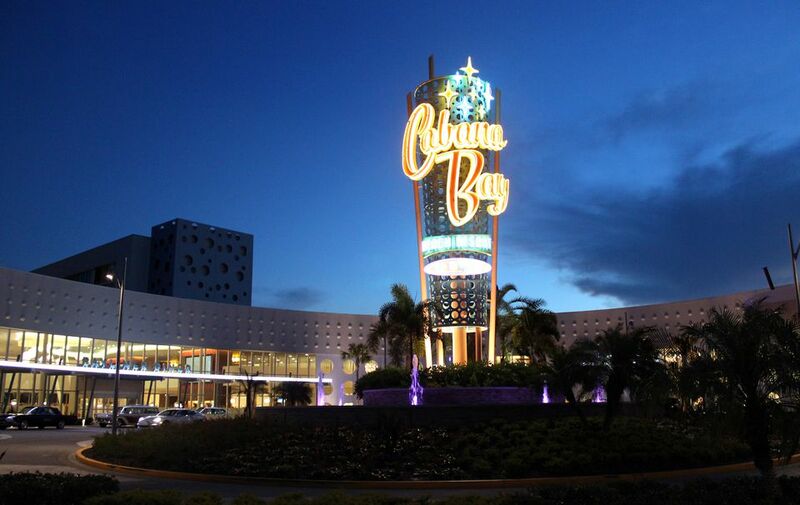 Cabana Bay is an idealized hotel straight out of the 1950s and 1960s. The designers obviously had a ball capturing the spirit of the more innocent times. As a guest (especially one who lived through the era and has fond memories of it), you can't help but smile at the charming and fun details that are everywhere. Take the Swizzle Lounge in the hotel's sunny and spacious main lobby, for example. Belly up to the bar or sit on one of the red vinyl chairs and order a throwback cocktail. You'll feel like you've wandered into an episode of Mad Men in which Don Draper goes on vacation. Among the most striking and wonderful features of Cabana Bay are its two pools. The larger one includes a water slide that is built into a structure made to look like a high dive platform. (Before diving accidents and lawsuits made them all but disappear, pools would regularly include diving boards.) The pool also features a water play area for toddlers. The smaller pool offers a lazy river, which is a great feature. That's the good news. The not-so-good news is that Cabana Bay does not offer complimentary tubes in which to float around the river. (At least not in 2018) Instead, it will sell you an inner tube. Cabana Bay offers two types of room configurations: standard and family suites. The suites are an especially good deal. The rooms are quite comfortable and include two queen beds that are separated from the rest of the suite by a sliding door. Outfitted in chic designs and a snazzy palette of colors, the rooms scream early 1960s. The suites also feature a living room-like area with a couch that pulls out to a queen bed. There are two large-screen TVs to accommodate two groups of suite-mates. The suites do not include a desk or any kind of workspace. Then again, the Cabana Bay isn't exactly the type of hotel that would generally attract business travelers. Up to six guests can stay in a suite, and the bathroom area is set up well to accommodate all of them. There is a sink in the center. Behind a door to the left of the sink, there is a toilet stall. To the right of the sink is a room, separated by another door, with a bathtub/shower and a second sink. As an example of the engaging little things that Universal and Loew's Hotels have embedded throughout the resort, the toiletries in the bathroom include Zest soap and Alberto VO5 shampoo, two brands that are mid-century America throwbacks. The hotel includes a main dining room, the Bayliner Diner. Set up like a food court, the stations include pizza and pasta, burgers, and salads. Patrons tote the quick-service food to a cavernous dining area. Large screens play commercials, cartoons, and another vintage TV programming. The food is just OK. We would have preferred if the restaurant was made to look more like a diner and featured milkshakes, meatloaf, and other retro fares. There is a more intimate restaurant inside the bowling lanes on the hotel's upper level. There is also a Starbucks (which horribly breaks the mid-century theme) off of the lobby. There are many wonderful places to eat throughout the resort (many of which are far better than anything served at Cabana Bay). Yes, you can go bowling at Cabana Bay. Galaxy Bowl offers 10 lanes of ten pin. As we mentioned earlier, there is also a small bar and restaurant that serves pizza, burgers, and appetizers.